Nightwing and Batgirl team up to defend Gotham City from super-villainy and crime! This excellent Batman DC HeroClix Marquee Figure features the awesome Nightwing / Batgirl Duo HeroClix Mini-Figure. 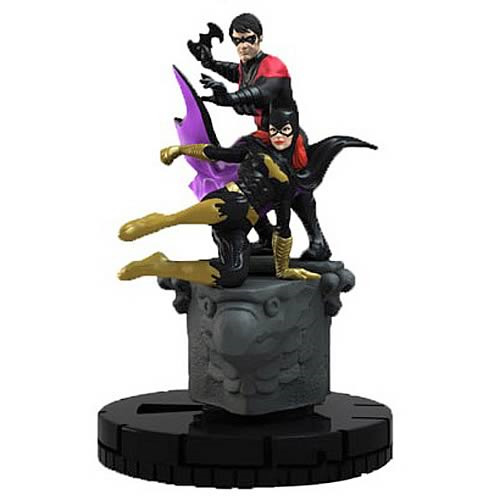 It's an extra-special and extra-powerful HeroClix mini-figure with both Batgirl and Nightwing together as they spring into action from atop a building! The Batman DC HeroClix Nightwing and Batgirl Duo Marquee Mini-Figure is an excellent item for any fan of Batman or HeroClix! Ages 14 and up.